The Mountain of Grabarka is the biggest Orthodox sanctuary in Poland and a holy place for Orthodox followers. It is compared in significance to catholic Czestochowa. Situated in the forest, away from cities and main roads, it attracts thousands of worshippers and pilgrims every year. 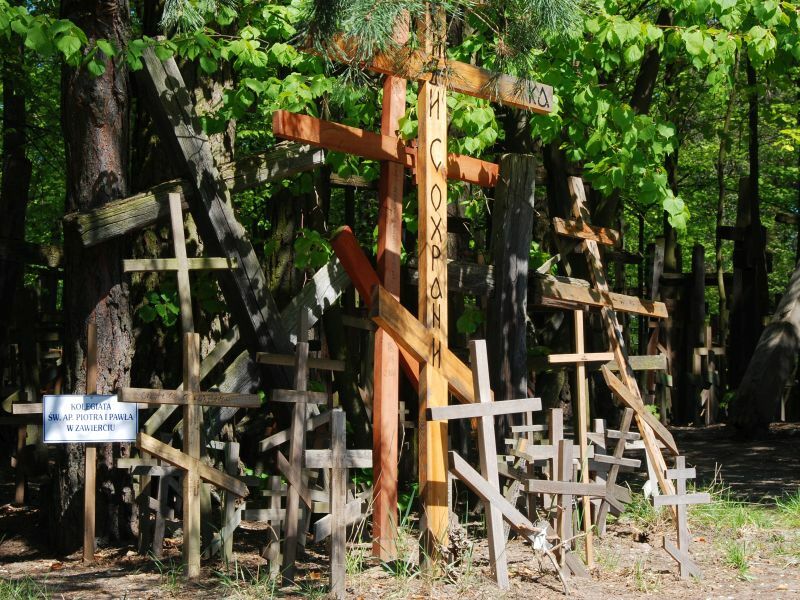 The Holy Mountain of Grabarka is also known as the Mountain of Crosses. On the top of the hill, there is an Orthodox church surrounded by thousands of votive crosses. They come in different forms and sizes, from small ones made of sticks, through bigger wooden crosses to few concrete ones. Some of them are already rotten, some brand new, often with epitaphs engraved in Cyrillic alphabet. All of them, however, were brought for personal intention by diseased, distressed and those seeking hope. Worship of this place and tradition of bringing crosses was born in the 18th century. The famous miracle was recorded in 1710 during the cholera epidemics. Decimated by disease, inhabitants of Podlasie region fled the towns and villages for fear of their lives. At that time an old man experienced a revelation that the only way for salvation was to go to the Mountain of Grabarka with a cross. He went there with some other villagers, brought a cross, bathed his face and drank water from the spring spurting at the foot of the hill and prayed. A miracle happened: all those who followed him were cured and saved. To express their gratitude, the people built a wooden chapel on the top of the hill. It was later extended into the Transfiguration Orthodox Church. Pilgrims have been bringing votive crosses to the hill ever since. They arrive in large numbers especially on the 19th of August, the day of Transfiguration of Jesus. Pilgrims climb the hill, leave their crosses there and pray or participate in an all-night vigil. On the way down, they stop by the stream and bath the face and sore parts of their bodies with cloth soaked with water as the stream is said to have healing properties. Wet cloths are left then by the stream or hung on the tree branches as a symbol of the diseases and worries leaving their bodies and left behind. The Holly Mountain of Grabarka is the home of the only female Orthodox convent in Poland. Founded after the Second World War, the Martha and Mary Convent of Mercy is now inhabited by a few nuns. In 1990 the wooden Orthodox church was completely destroyed by the fire. Only two icons survived and a fragment of the Gospel Book. Immediately, reconstruction works began. A new church was consecrated in 1998. There are also two pilgrim’s rest houses on the hill and a small cemetery.